A man who barricaded himself in his bedroom and set fire to it while his housemate was eating her lunch has been jailed for four years. Dawid Stroinski, 31, of Collyer Avenue in Bognor, pleaded guilty to arson being reckless as to whether the life would be endangered. 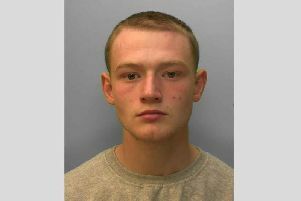 Appearing by video link from Lewes Prison, he was sentenced at Portsmouth Crown Court today. Prosecutor Darren Bartlett said: “At about midday on April 4 he was in the house with one other person. “She thought she might have left the oven on and asked the defendant what was going on. She rushed to his room and tried to open the door, but he had blocked it with a wardrobe. The court heard that she managed to persuade him to open it a small amount, and then she grabbed him and took him downstairs. She then went back to rescue her cat and left the building. Within five minutes the emergency services arrived. The fire brigade put out the blaze and the police arrested Stroinski. The blaze caused £30,000 worth of damage to the house, the court heard. Defence barrister David Bathurst said: “As we have seen so tragically in the case of Grenfell, fire can spread very quickly and the potential for fatalities is obvious. He told the court that despite different accounts from Stroinski, the defendant had insisted to him that it was a suicide attempt. Judge William Ashworth sentenced Stroinski to four years in prison for the offence, cut down from six because of his guilty plea. He told the court that according to reports the ‘likely cause’ of his behaviour was ‘significant drugs use’ of amphetamine and cannabis. He added: “It is only a matter really of good fortune that [your housemate] acted in such a responsible and brave manner. A picture of Stroinski will added to this story as soon As Sussex Police make one available.